Enthusiastic partisans of early music have something in common with the fervent admirers of music written now and in the not-too-distant past, although neither side may realize it. Both camps have a strong urge to explore undiscovered music, and often an almost equally strong wish to experience the pleasure of being immersed in the flow of unusual sounds. And both are devotees of the Hilliard Ensemble, the basically a capella quartet that, with increasing frequency, is sharing its magically intimate timbres with chamber groups and symphony orchestras. The ensemble, which is in a class by itself, is always one step ahead of the doubting Thomases. It keeps one foot in the fourteenth, fifteenth, and sixteenth centuries, and the other firmly in the twenty-first. It is just as comfortable working its way through long-forgotten scores as discovering the subtleties of those where the ink is barely dry. The ensemble is lauded by critics for the artistic integrity of its interpretations, while a large and adoring public devours its crossover recordings. The Hilliard vocal quartet was founded in 1974. Its initial goal was to explore the pre-baroque repertoire and make it better known to the public. It is named after the Elizabethan miniaturist and goldsmith, Nicholas Hilliard. There may also be a somewhat hidden allusion to conductor Paul Hillier, now working in the United States. As a singer he worked with and supported the group early in its career, suggesting a number of directions to take in programming its first recitals. 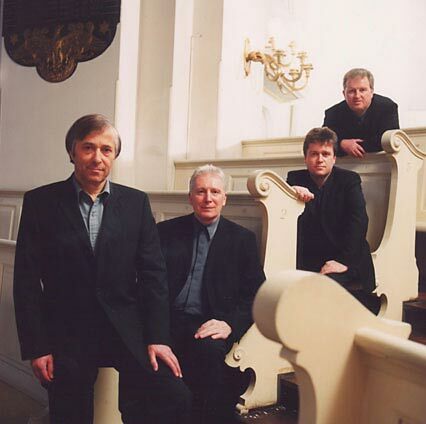 The early music craze had hit England in the 1970s, and the Hilliard Ensemble was soon in great demand. A number of recordings on the EMI label in the 1980s (later issued on the Virgin label) bear witness to the purity of the group's voices--but above all to the seriousness and the desire for authenticity with which it approached the repertoire. A decisive encounter with Estonian-born composer Arvo Pärt was to push the Hilliard Ensemble's musical boat toward contemporary shores. Over the years a fruitful relationship was established that included ECM recordings of Pärt's Arbos, Passio, and Litany, and the Hilliard became his favourite vocal ensemble. A further meeting, this time with Norwegian jazz saxophonist Jan Garbarek through the good offices of producer Manfred Eicher, helped bring the four Hilliard members to mass public recognition. "We knew, the moment we met Jan, that we would make music together," explains tenor Rogers Covey-Crump, who has been with the ensemble since 1984. In Officium (1994) and Mnemosyne (1999), the Hilliard introduced a whole range of a capella vocal works (from the twelfth to the sixteenth centuries in the case of Officium, and from ancient times to the modern era in Mnemosyne). To these works, Garbarek's improvisations add a fifth voice, which gives them new lustre and a surprisingly modern aspect, transforming a rather obscure repertoire into a musical product that can be appreciated by an impressive number of recorded music fans (of every category). (Officium is still one of the best crossover sellers of the 1990s). 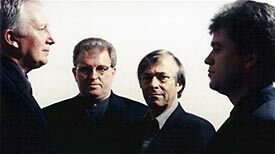 Since that time the group has established links with contemporary composers who write expressly for the Hilliard singers, since generally speaking the current repertoire has few works for the Hilliard's four voices--a countertenor (David James), two tenors (Rogers Covey-Crump and Steven Harrold), and a baritone (Gordon Jones). It has done this through seminars, workshops, fortuitous encounters, and a composing competition organized by the Hilliard in 1994, resulting in 110 works, many of which are now in the ensemble's repertoire. The apparently dual nature of their repertoire doesn't deter the Hilliard singers, who admit to having a preference for crossover concerts that allow early works to be juxtaposed with contemporary pieces. "From a philosophical standpoint, all music is new because we are interpreting it," points out tenor Rogers Covey-Crump. "We don't make a real distinction. The music tells us what style is wanted; we merely respond to its demands. We approach early music as though it were new." Covey-Crump, the ensemble's artistic director, explains the differences between the two types of music: "With early music you have nothing to guide you about how to perform it. You can base your interpretation on a musicologist's opinion. Of course we take this into consideration, but basically we ourselves decide on such questions as tempo, dynamics, and how to place the words beneath the notes." Morimur, an enormous project, was produced in 2001 under the guidance of musicologist Helga Thoene. She constructed a memorial to Maria Barbara, Johann Sebastian Bach's first wife, around the Partita in D minor for solo violin (which ends with the famous "Ciaconna"). Selections from Bach's sacred chorales are interwoven with the violin solo, culminating in the superimposing of vocal extracts on the melodic line of the "Ciaconna." "Current composers habitually provide markings to show the dynamics and time-signatures, and of course we take these into consideration," adds Covey-Crump. "However, it's very interesting to note that Arvo Pärt gives very few directions, and on paper his scores resemble early music in that he trusts the musicians to transform the notes on the page into music, without any indication of dynamics or tempo." The greatest challenge for an a capella ensemble is always the accuracy of the notes sung by each member. Singers can't enjoy the ease of an instrumentalist, who simply has to play the note. They have to create the sound out of nothing (or almost nothing) and be sure it's absolutely right--a meticulous task that fills a good portion of rehearsal time. "We have to learn how to sound each chord individually in order to be sure it's right," maintains Covey-Crump. "All four of us can sing one note and the resulting chord sounds fine, but it isn't necessarily what the composer had in mind. Sometimes I act as leader in our practice sessions because I have perfect pitch and can hear individual notes and harmony very clearly." Peter Schubert, artistic director of Montreal's Viva Voce ensemble, has worked with the Hilliard Ensemble in New York and remembers the unbelievable ease with which Covey-Crump caught the slightest fluctuation and the smallest error in pitch. "He explained to us how to sing intervals as in the sixteenth century," Schubert recalls. "The choir had to project very accurate intervals. What I admire most about the Hilliard members is their sonority and pitch." Hilliard's artistic director explains how it works. "Technically, if you put four singers together they'll only sing a chord in tune if it is literally tuned. By that, of course, I mean pure tuned. The note you sing is transformed into its harmonic components. No keyboard instrument could do this, because it would be totally impracticable. When a chord is in perfect tune, it's impossible to hear the individual singers because the fusion is so perfect. Very often, when a group is not totally together, it's because it isn't perfectly in tune. After all, we do like to sing in harmony!" Despite a busy schedule of nearly a hundred concerts a year, David James, Rogers Covey-Crump, Steven Harrold, and Gordon Jones believe in the need to work with composers and singers of the rising generation. For example, they spent a week working intensively with emerging composers at Harvard in 2001, enabling the younger musicians to learn on the spot the difficulties of writing for a small vocal ensemble. For the last few years they have also given a week of workshops (which, alas, won't take place in 2003 due to renovations in the building where participants meet). The workshops enable seven or eight groups of singers to work on new repertory, particularly the works of a composer-in-residence. In 2002, this was Canadian composer Jonathan Wild. The Hilliard members take part in several of these practice sessions, along with various guest teachers who join the group. "Participants sometime get as many as six different opinions on how to do things," says Covey-Crump. "We think it's an important process because no one ever has the answer to everything when it comes to how you interpret a particular piece. After this, they can make up their own minds and put forward what convinces them as a group." There's no need to look for what makes the Hilliard Ensemble such a close-knit unit. The members say they get along "extremely well" and chat over one or two good meals every day when they're on tour. "A capella singing is always satisfying," says Covey-Crump. "To be able to respond to the variations of each of the group members without being at the mercy of a conductor who stands between you and the music is such a pleasure! You have infinite flexibility in matters of dynamics and rhythmic nuances, and it's so nice just to be able to make music with people who have similar skills." Perfection is an inaccessible goal, and each day the group works on their repertoire, even if surprises are always a welcome event in concert. "We strongly believe that the final interpretation should be left to concert nights, because tempo and dynamics depend enormously on where we sing." Win recordings of the Hilliard Ensemble, courtesy of Universal by visiting www.scena.org. mini-Opera, in 2002), Elizabeth Liddle, Rudolf Kelterborn, Joanne Metcalf (who won the composing competition organized by the Hilliard in 1994), Arvo Pärt, and Alexandre Rastakov. Two new Canadian works are also on the program, one by José Evangelista ("magnificently transparent textures") with words from works of English poet William Blake, the other by Paul Steehuisen backed by a tape recording. On March 5 the ensemble will be accompanied by the McGill Contemporary Music Ensemble conducted by Denys Bouliane. The program features Bloed (Blood), a work designed as a plea for peace by Dutch composer Cornelis de Bondt. Members of the Hilliard Ensemble will also give a public rehearsal on March 3 and a master class (free) on March 4. (514) 843-9305.